EDUCATION: Fundación Ortega & Gasset, Toledo, Spain, Latin American and European Studies Diploma (1986), University of Puerto Rico (B.A., 1988; J.D., 1991); Tulane University School of Law (LL.M. in Admiralty, 1992). 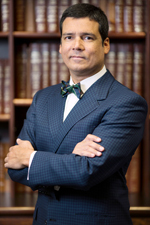 REPRESENTATIVE CASES: Segarra Jiménez v. Banco Popular de Puerto Rico et als., 421 F. Supp. 2d 452 (D.P.R. 2006); Pan American Grain Manufacturing Co. v. Puerto Rico Ports Authority, 121 F. Supp.2d 710, 2000 AMC 692; aff’d, 295 F.3d 108, 2002 AMC 1988 (1st Cir.2002); Navieros Inter-Americanos, S.A., Inc. v. M/V VASILIA EXPRESS, et al., 930 F.Supp. 699 (D.P.R.1996); Cigna Ins. Co. of P.R. v. M/V SKANDERBORG, 897 F.Supp. 659 (D.P.R.1995).